The Billy Graham Center Museum provides visitors with an experience that extends their understanding of the good news about Jesus, whether becoming aware of God’s offer of his love through Jesus, being inspired to follow Christ, or growing in desire and ability to share the gospel. 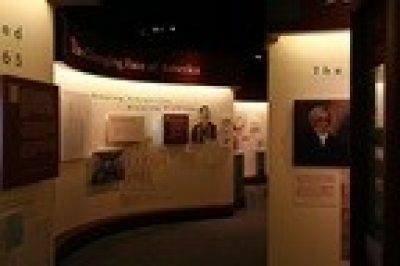 The Museum offers an inviting, informative and inspiring experience for the general public on the story of evangelism in North America, especially the ministry of Billy Graham. The Billy Graham Center Museum, located on the campus of Wheaton College (25 miles west of downtown Chicago), hosts between 35,000 and 40,000 guests per year. The Museum has been in operation since 1980 and is open most days of the year including Sundays. Visitors will enjoy a unique visual overview of the history of Christian evangelism and its influence on American society. It is a family-oriented museum, with rare artifacts and interactive displays that begin with the early history of America and climax with a powerful walk-through presentation of the Gospel message. The museum consists of 20,000 square feet of permanent and temporary exhibit space. The Museum offers a changing selection of temporary exhibits that depict the themes of missions, evangelism, and contemporary Christian art.